The text comes from the 1960s Der Zuschnitt XVIth edition from Rundschau. As usual, please keep in mind that this version of the Rundschau cutting system is now 40 to 50 years old and that it has evolved in the subsequent time period. If you found this version of the Rundschau system useful then you will probably want to purchase the latest modern version directly from the Müller & Sons website. Unfortunately, it is available only in German. The newer system will be presented to the reader differently, and where possible should be read as being complementary to the 1960s system presented here. It is also strongly recommended that you also support Rundschau by subscribing to their journal (both the ladies' as well as the gentlemen's editions), as it is the last remaining classic tailoring journal still in print anywhere in the world. Information on how to subscribe can be found in this thread. They even have CAD programs based on the Rundschau cutting system, although this is more for industry cutters. One of the most sophisticated sleeve cutting systems published is the Rundschau system. It is a little more complex than some other ones, but very logical and easy to follow. First of all you need to measure the dimensions of the armscye. 3. To find the armscye height for sleeve draft take the average of the above two measurements. 1. First measure around the circumference of armscye - again without the seam allowance. c/e1/R elbow seam for the under sleeve. The under sleeve is now complete. All seams (3/4cm) have been allowed for. Using the basic formula: 1/2 armhole width + 1cm will give you a wide sleevehead, which may not be appropriate for all materials. 1/2 armhole width, maybe even minus 0,5 to 1cm will make the whole process easier. For industrial purposes a sleeve should be 6 to 8% wider than the armhole, for bespoke it can have 10 to 12%. But this will work with softer materials only, so it is recommendable to use just one sleeve draft (the less wide one) for any kind of material. Those interested in a Rundschau overcoat sleeve see this thread. The Rundschau collar system from Zuschnitt XVII circa 1960 can be found in this thread. Edited by Der Zuschneider, 05 March 2012 - 03:46 AM. I think this is the right place for my question. As I'm doing my gents pattern now without seam allowance I noticed: If I draft the sleeve with the ladies draft or with a gents taking the same armhole measuements I get different sleeves. I know why it is happening it is a different way in the draft. But I do not know why this is requiered. You can see in the attached picture that the difference is about 2 cm in sleeve cap circ. 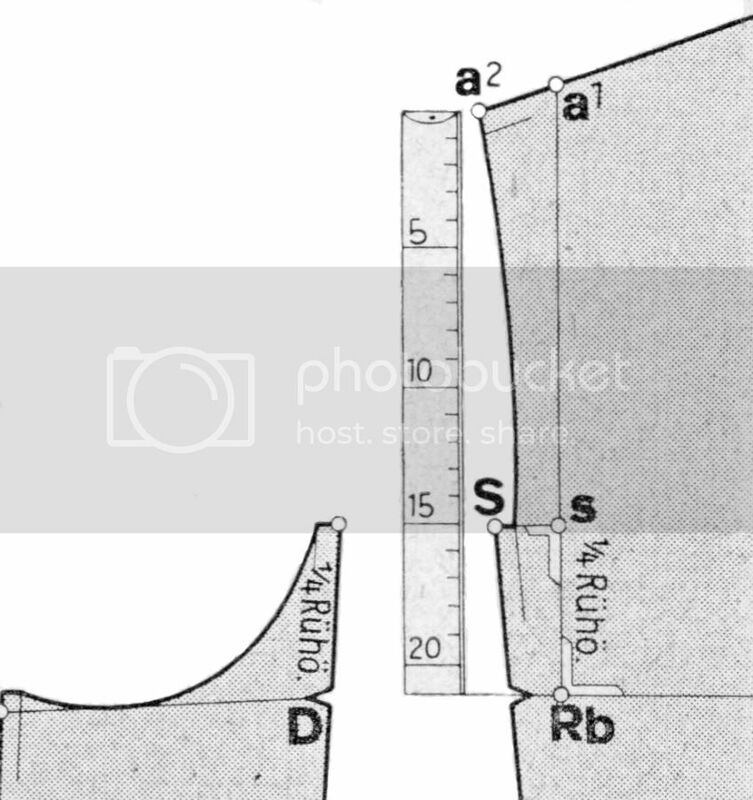 The armhole has a circ about 54.6 cm in both drafts. Has anyone from the Mueller experts an explanation?? The Men armhole is with seams the women armhole without. 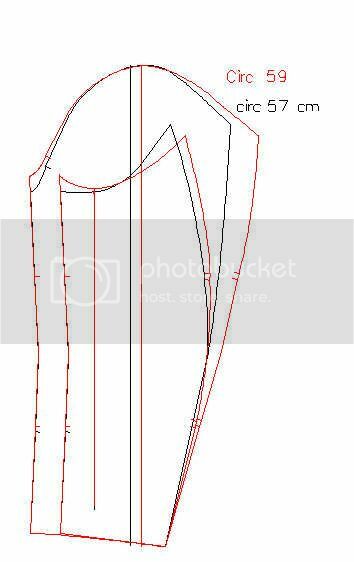 To compare both sleeves you need to mesure the armhole of the men 0,75cm back. 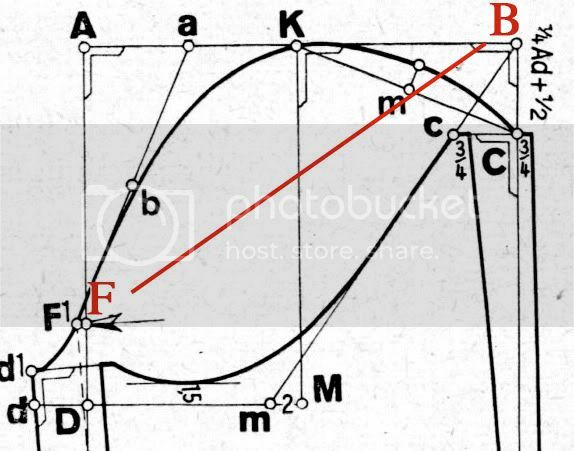 So you have two different armhole circles. Maybe you forgot that. Or think like that: the 59cm sleeve cap is with seams and the 57cm sleeve cap is without seams. Edited by Der Zuschneider, 07 May 2012 - 12:32 AM. If it were so simple - but I did not forgot. I wrote that I transfered all gents draft to no seam allowance and that includes the coat too. I'm more a ladies drafter than a gents. And I find it a pain in the .... to remember which draft has a s.a. (and where) and which not - as the men shirt's draft is without. An old Zopf (braid??) which should be cut!!!!! Resumee: The ladies sleeve is wider than the gents and has more ease. I tried to get a gents body Rb measurement out from a table (besides all the propotional stuff). I found only in UNIcut-system for a 100 bust(my example)a Rb about 20.5 cm body measurement. Rundschau calculate with 21.3 so it would be 1.2 cm ease for the back. A ladies draft takes for a jacket 1 cm AND they add 1.3 cm for the armhole. I can see an advantage for this if you want to draft kimono sleeves etc. (as it is often the case) you need a wide back then. But with a normal draft - I do not know - I ever wondered. I'll try the smaller sleeve in my next jacket. I have not written it right (english is not my language), Zuschneider, the 59 cm cap is a ladies draft and is definitively without s.a.the 57 cm is a gents draft without s.a. Same armhole circ, same cap height, same armhole height a.s.o. Edited by posaune, 07 May 2012 - 06:11 AM. I hadn't seen this earlier (or maybe I did, did not answer since I'm not a Muelher expert, and forgot). The only explanation I can see why a ladies sleeve would be wider than a men's one would be if the back body had less ease in the ladies's coat. In men coat, we usually place quite some ease. I'm not a cutter for ladies, but I have the feeling that coats are more body-hugging, and if there is not the necessary ease in the back, then it must be in the sleeve, if one wants to be able to move the arms forward. I just checked the drafts published here. It is not enough a difference to explain the sleeve difference. So I don't understand either. The difference is because Women have not so muscular arms and sleeve width and don’t need such head roll as well. But 5 - 10mm is not much difference minus 12%. RTW also uses less percentage for men as it is easier to set the sleeve in for today light fabric. Women drafts are without seams in the armhole, for the sleeve it doesnt matter which way it is drafted. ...except here, the biggest sleeve is the women's, not the gents's. The ease I was talking about is in the back, and I agree it doesn't make that big a difference. Posaune said the difference in the sleeve head is 2cm, and this is significant. I also just understood that Posaune had also checked the back ease hypothesis, I hadn't understood this part at first reading. But the armhole circumference is bigger when you measure on a women system without seams. But there can be other mistakes. I have not read the first post.